If your little girl likes fairies, a Tinker Bell birthday party will be better than a trip to Neverland. Make sure you get your Tinker Bell party supplies and decorate simply with greens and yellows or elaborately, making the room into a scene from Neverland. Do you have a fun Tinker Bell party idea? Share Tinker Bell games, cake or decorations. We want to hear it all! Share your ideas here. When you send the invitations to your Tinker Bell party, instruct the guests to wear a Tinker Bell costume, or to dress up like their favorite fairy. Little girls love to dress like fairies and will enjoy the chance to do so. Fairy costumes can be fairly easy to put together too, with just a skirt and wings. Of course costumes can be purchased, which would make a nice birthday present as well. Don’t forget your Tinker Bell party supplies. Paper products, table decorations and party favors are available with the Tinker Bell theme or Tinker Bell colors. With guests dressed like Tinker Bell, they will be enthusiastic about playing Tinker Bell party games like Catch the Pixie Dust or Fastest Fairy Flier. You can also make crafts, such as Tink's treasure can, a fairy wand, fairy crowns or fairy wings. A Tinker Bell birthday party is not complete without the cake. 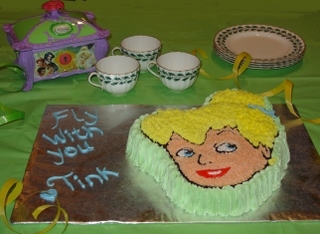 Check out our Tinker Bell cake ideas. 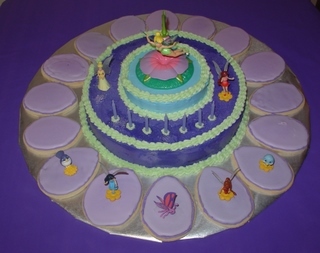 Tinker Bell and Friends in flower: This unique cake calls for 2 round cake pans and an oval shaped cookie cutter. Make a flower and place Tink and her fairy friends inside. Character pan Tinker Bell cake: Using a character cake pan and the star tip decorating technique, you can make an easy, but fun cake. Spice it up using the cake board for the birthday message. I’ve also seen some really unique Tinker Bell cakes. Depending on how elaborate you want to go, you can create Tinker Bell’s oak tree home or simply add a Tinker Bell Disney figurine to the cake. Keep in mind that any image can also be copied onto a cake with edible ink. This has to be done at a bakery that has the right kind of edible ink and printer. Your party is sure to be a hit with Tinker Bell party supplies, games and a unique Tinker Bell cake. Check out some of the great Tinker Bell party supplies we've found. Click on the images below for more information or to order.